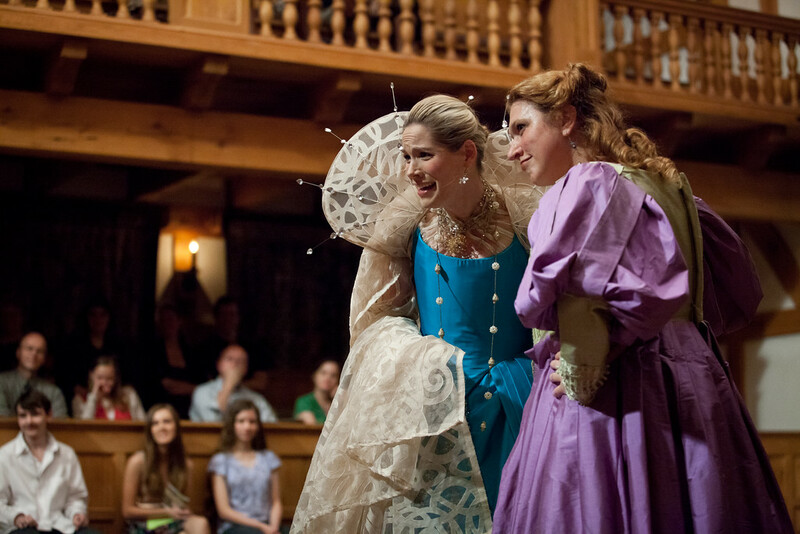 Tracie Thomason and Allison Glenzer in THE MERCHANT OF VENICE. 2012. 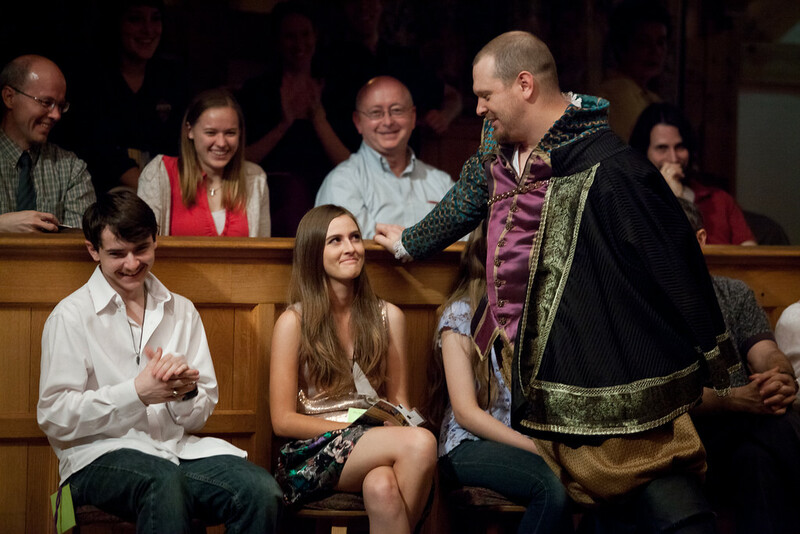 Benjamin Curns in THE MERCHANT OF VENICE. 2012. 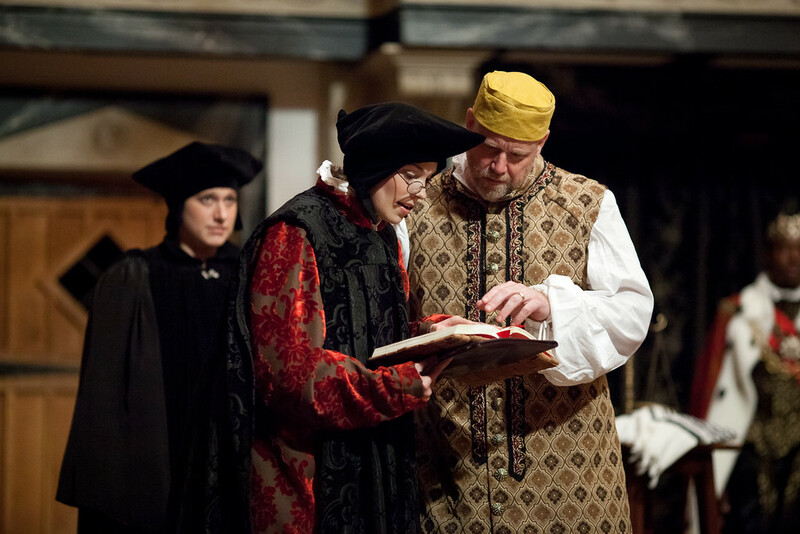 John Harrell in THE MERCHANT OF VENICE. 2012. James Keegan in THE MERCHANT OF VENICE. 2012. 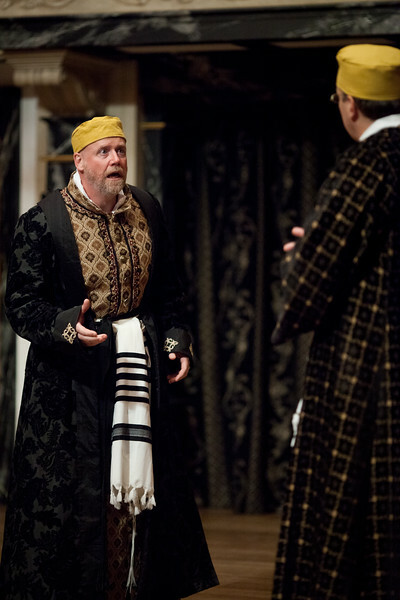 Chris Johnston in THE MERCHANT OF VENICE. 2012. Tracie Thomason and Gregory Jon Phelps in THE MERCHANT OF VENICE. 2012. 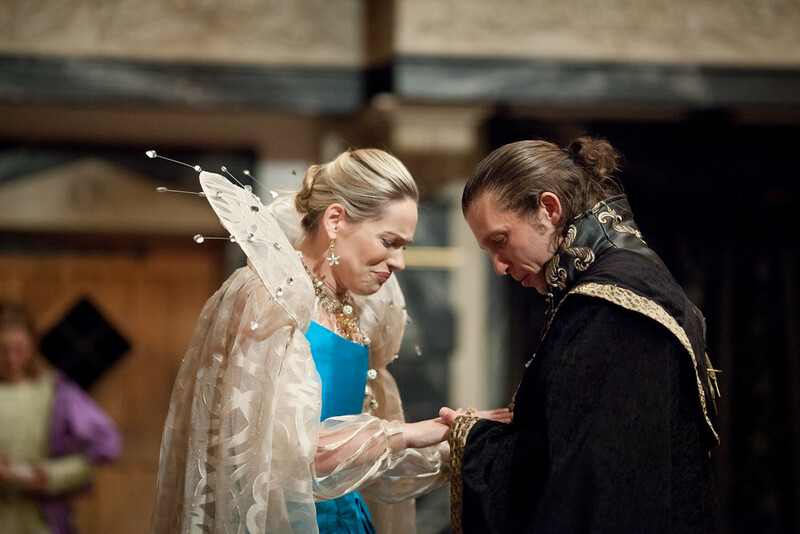 Abbi Hawk and Chris Johnston in THE MERCHANT OF VENICE. 2012. The cast of THE MERCHANT OF VENICE. 2012. 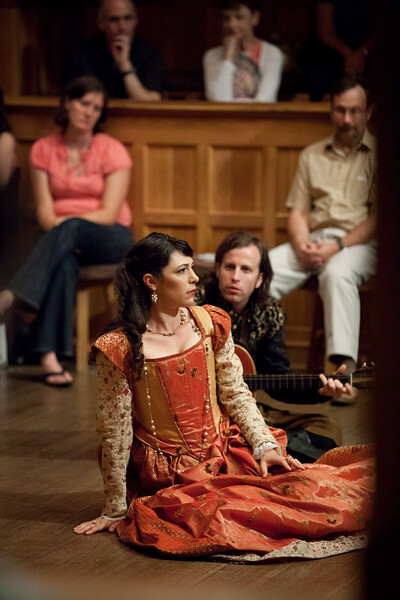 Allison Glenzer, Tracie Thomason, and James Keegan in THE MERCHANT OF VENICE. 2012. 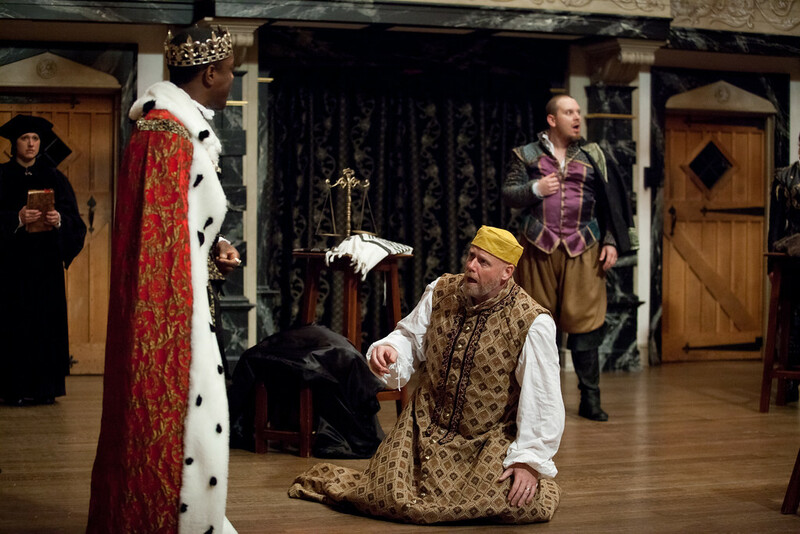 René Thornton, Jr. and Gregory Jon Phelps in THE MERCHANT OF VENICE. 2012. Antonio, the “merchant of Venice,” is sad; his friends try to cheer him up. 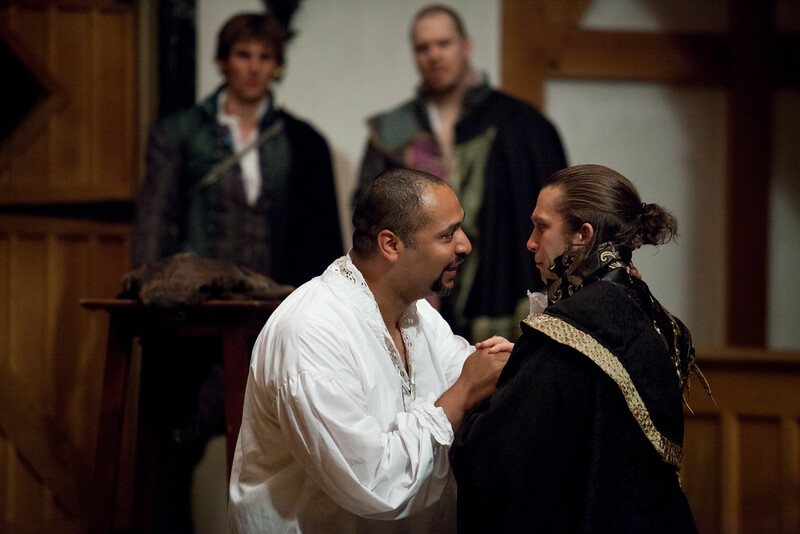 Bassanio, Antonio’s closest friend, asks Antonio for financial help in wooing Portia, the rich heiress of Belmont. Antonio’s “fortunes are at sea,” so he cannot provide Bassanio with cash, but he agrees to “inquire where money is” and leaves with Bassanio to find someone who will loan him the money. At Belmont, Portia and Nerissa lament the “lottery” provision in the will of Portia’s dead father: a potential suitor must choose among three caskets; the suitor who chooses the correct casket, which contains a portrait of Portia, wins Portia’s hand. Suitors risk much: “if [they] choose wrong, never to speak to lady afterward in way of marriage.” Portia and Nerissa mock the suitors who have already tried and failed. Bassanio and Antonio ask Shylock, a rich Jewish moneylender, for a loan of three thousand ducats. Shylock offers to lend the money under the condition that, if the men cannot pay back the appointed amount on the appointed day, Antonio must forfeit a pound of his “fair flesh.” Antonio agrees. The Prince of Morocco arrives in Belmont to woo Portia. 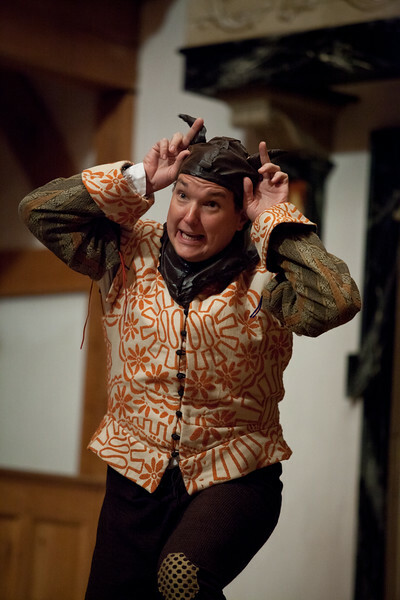 Launcelot Gobbo decides to leave Shylock’s service and become Bassanio’s servant. Jessica, Shylock’s daughter, says goodbye to Launcelot and then makes plans to elope with Lorenzo, a Christian friend of Antonio and Bassanio. At Belmont, the Prince of Morocco and the Prince of Arragon choose caskets in attempts to win Portia’s hand. Shylock discovers that his daughter has eloped with a Christian and that Antonio’s ship will not arrive in time to pay the loan. Shylock decides that he will demand the pound of flesh promised to him in Antonio’s bond. Bassanio arrives in Belmont and chooses a casket. Solanio arrives from Venice to tell Bassanio that Shylock has demanded the pound of flesh from Antonio. Marriages, disguises, judgements, and things with rings ensue. Shakespeare gives The Merchant of Venice all the elements of a traditional “comedy,” but he also weaves in issues that are darker and more dramatic than the serious material in his earlier comedies. In Merchant, Shakespeare explores justice and mercy by reaching into his characters’ souls and shining a light on the prejudice and fear he finds there. Four hundred years later, the bigotry and hatred he exposes seem every bit as volatile, as vibrant, as meaningful, and as unresolved as they were when he first created Shylock and Antonio’s Venice. Some productions of Merchant in our post-Holocaust world seek to apologize for a playwright presumed to be anti-Semitic; and directors often try to package the problematic issues the play raises with neat and tidy final answers. The two founders of the ASC (one a Christian, the other a Jew) believe thee Shakespeare who wrote this play was not an anti-Semite, but a writer brilliantly exhibiting and dissecting anti-Semitism. 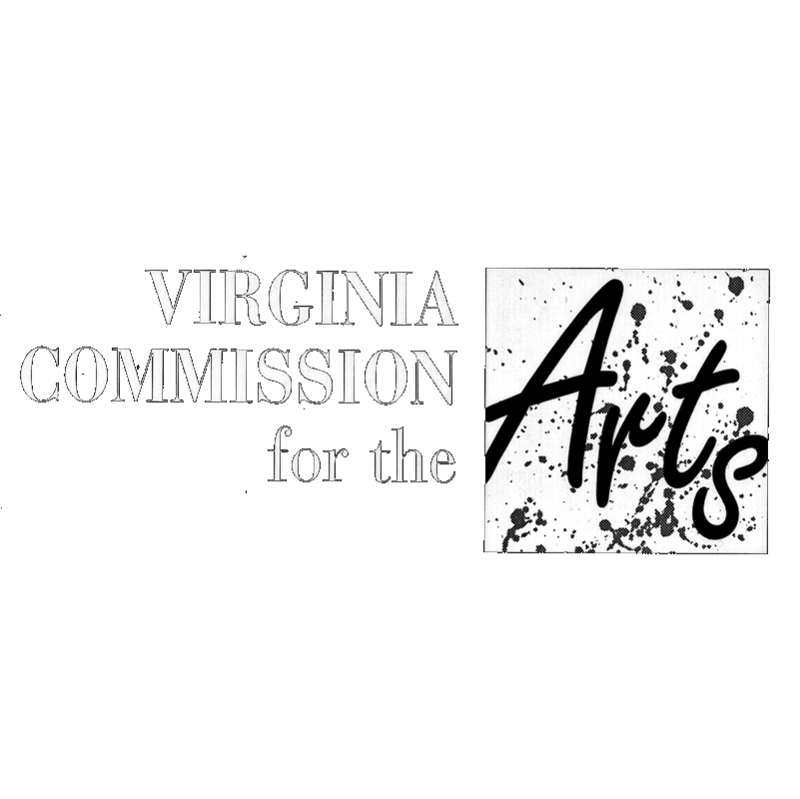 Accepting the notion that racism and bigotry were simply “how things were back then” is to assume a moral superiority for our modern world and to assume that Shakespeare was ignorant, floundering in an unenlightened age, rather than a playwright capable of creating a textured story with complicated and flawed characters. Some productions deal with the play’s ambiguity by cutting, softening, or ignoring the bigotry to tell a more palatable love story. More often, productions go to the other pole to minimize the romantic comedy and make the racial and religious nastiness the focal part of the story and turn Shylock into nothing but an abused victim, whitewashing Shylock’s character and ignoring the vicious things HE says and does: “II hate him for he is a Christian.” The horrors of the Holocaust have produced a residual Gentile guilt that causes some directors to want to make every Jewish character sympathetic in every situation. But Shakespeare gives us no political correctness in Merchant; Shylock can be extremely unsympathetic and most of the other characters are filled with both faults and virtues. Just like real people. With this Merchant, we’re attempting to tell the love story without masking the spiritual and moral warts that blemish the “heroes.” We’re also choosing to tell Shylock’s story without watering down either his harshness or his humanity.